From my observations, I think it’s not usual for “geeks” to be interested in sports. I mean, I seldom hear my geek friends talk about any sporting events, whereas they are always updated on what the much anticipated video game or anime titles that are about to be released. Despite being a self-professed geek who shares the same interests, I’ve always been a fan of sports throughout my life. And yes, I’m talking about sports in general: tennis, bowling, billiards/pool; at some point in my life, I followed these sports. The sport that I’ve been a fan of for the longest time, however, is basketball. Specifically, I’ve been following the NBA for more than a decade now and I’m not just following any one team but the league in general. I guess you could say that I’m interested in the NBA in an intellectual sense, such as keeping track of historical trends, the evolution of the game, and so on. There are exceptions of course. 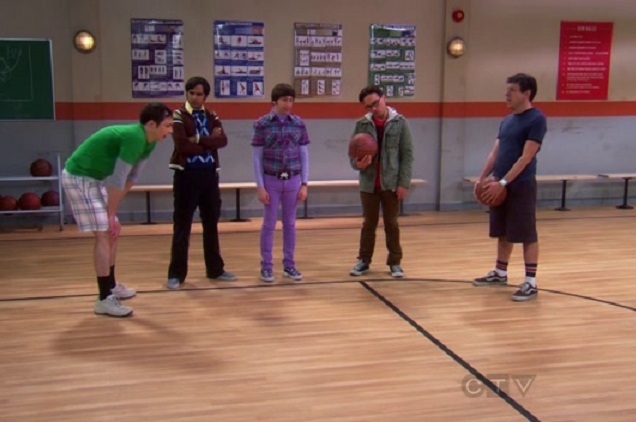 But in my experience, geeks and basketball generally do not mix. One would think that it would be natural for me to get into Fantasy Basketball, but I’ve actually never experienced it until recently. Like I said, friends of mine that can be categorized as “geeks” aren’t really into sports. And friends who are into basketball aren’t really into the stats, strategies, and the history of the game. So I’ve never had the opportunity to get into Fantasy Basketball until recently, when I was finally invited by an American colleague to join his private Fantasy Basketball League. Fantasy Basketball is a passive game where players (which I’ll call general managers or GMs to differentiate them from basketball players) form their own “fantasy” basketball teams from actual basketball players and then compete by comparing the stats of their chosen players. And that’s where being a geek helps – while you don’t need to be heavy on statistics and analysis in order to compete in Fantasy Basketball leagues, knowing your numbers and historical trends is a big advantage. I’ll go through my first ever Fantasy Basketball experience to show this. These statistical categories hold the key to winning this particular Fantasy Basketball league. Basically, in the league that I joined, each GM would earn one “fantasy point” each for every Point, Block, Steal, Assist, Rebound, Field Goal, and Free Throw made by any of their players. 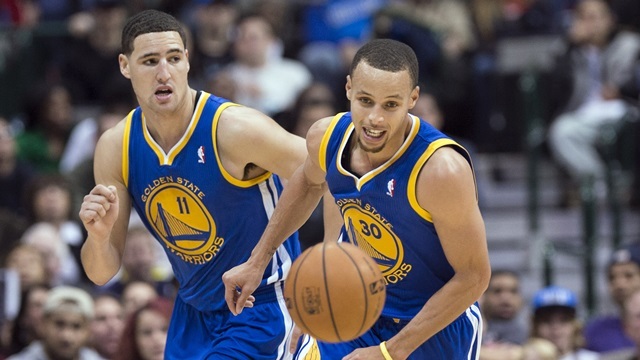 They earn two fantasy points for every three point shot made by their players, as well as if any of their players get a “Double Double”. A Double is the term used for a player who gets double digit figures in any two of the following statistical categories: Points, Blocks, Steals or Rebounds. Finally, GMs get even more points anytime one of their players achieve either a “Triple Double” or a “Quadruple Double”. A “Triple Double” is the term for achieving double digit figures in any three of the aforementioned categories, and a “Quadruple Double” is the term for getting double digits in all four categories. It all looks very straightforward, but there are patterns that one might miss out on that can lead to advantages. Here’s a simple example: let’s compare two players who managed to get 6 Points through two different ways – regular field goals and three point shots. If a player makes a regular field goal (a two point shot), that players GM earns three total Fantasy Point – 1 Fantasy Point for the Field Goal Made, and 2 Fantasy Points for the 2 points that the player made with the shot. 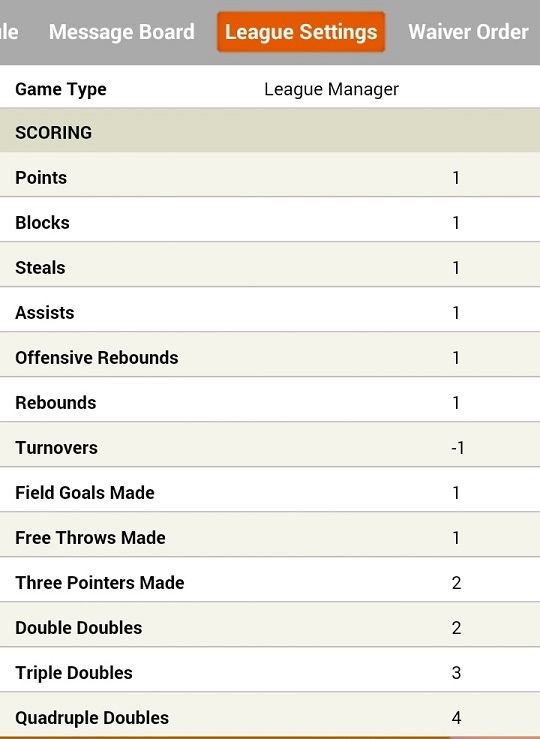 So if this player makes three regular field goals to get 6 basketball points, his GM earns a total of 9 Fantasy Points. However, if a player makes a three point field goal, his GM actually earns a total of 6 Fantasy Points – 2 Fantasy Points for the Made Three Pointer, 1 Fantasy Point for the Made Field Goal (a three point shot is still a field goal), and 3 more Fantasy Points for the 3 basketball points that the player earned. If that player makes two three point shots, he earns 6 basketball points (the same as the previous example) but the GM earns a total of 12 Fantasy Points! Basketball players who score via the three point shot can, in the Fantasy League that I’m in, earn me more Fantasy Points. It was in finding this and other similar nuances in the league rules where I think being a geek gave me a little advantage, especially in what would be the starting point of the Fantasy league: The Draft. Just like in the NBA, us Fantasy GMs would have to go through the process of choosing, or “drafting”, players for our fantasy teams. Unlike in the NBA where GMs can only draft rookies, drafts in Fantasy Basketball involve all the active players in the league. I’m not going to reveal what strategies I used in selecting players during our draft though. All I’m going to say is that I used my interpretation of the League rules to find any advantages and based my draft selections on that. Of course, having a strategy isn’t enough, and this is where being a geek helped me a lot as well. Like I said, my interest in the NBA is more of an intellectual sense so I’m a fan of the NBA in general and not any specific teams or players. I’ve been reading different NBA-related articles for years now, whether it’s about favorites like the Warriors or LeBron James or less popular teams and players. There are ten Fantasy GMs in our league. After the draft, we were all randomly matched up and have to compete against each other in pairs, with rounds divided into different weeks. The winning GM of a match up is the one who accumulates the most number of Fantasy Points during that week. At some point in time, two of the Fantasy GMs will be eliminated and the remaining will go through tournament style knock-off stages until one Fantasy GM is left standing. As I said earlier, this is a passive game. After the draft, I am mostly limited to waiting for the real life NBA games to happen and hoping that the players I drafted will meet or even exceed my expectations. I do have the option of tweaking my team’s lineup on a day to day basis in several ways. Each GM is allowed to draft seventeen basketball players for their team, of which only twelve can be active with the rest on the “bench”. Not all players will have scheduled games everyday, so I will need to move players to and from the bench and the active list. And there will be days wherein more than the twelve active players will have scheduled games, so I’ll need to decide which ones to place in which list. GMs can only earn Fantasy Points from the players in their active list, so they’ll need to choose the players who they think will be the most productive – once an NBA game has started, GMs can no longer move players who are playing in that game. Aside from this, GMs are also allowed to trade players between themselves and to release and sign undrafted basketball players. I haven’t done much of this as of yet, so I can’t really provide further details. But I know the option to do this is available. And that’s pretty much the long and short of it. Since joining the Fantasy Basketball league, my appreciation for the NBA changed. I’m now paying more attention to the performances of individual players, both in terms of the level of detail that I’m looking at and the frequency. I did say that I’m going to show how being a geek helped me, so I’ll say this: There are ten GMs and after two game days, I have the third highest accumulated Fantasy Point total among the group despite this being my first time at trying this out. Am I going to hold on to this spot or maybe even win the entire thing? Of course, I don’t know. Being a geek helped, but there are a lot of different factors involved here such as luck and experience – I’m playing with folks who have been doing this for several years now, after all. What I can say for sure is that Fantasy Basketball has made me appreciate the NBA in a geeky way. Have you tried Fantasy Basketball yet? What about other Fantasy Sports? Tell us what you think by leaving a comment or two below!